My car to get me around in the ski country was of all things an MG-TC. Red. I had a ski rack devised that carried one pair of metal skis, then a new idea, attached to the passenger’s side front fender and the rear corner of the tiny running board..I traveled alone. The Brits were not much for creature comforts like warmth so I had a heater of sorts installed. It was like a feeble dog breathing fitfully on my ankles. Coming off a ski hill to drive off into the gathering darkness I donned one of those tent-like parkas with a fur-lined hood left over from the 10th Mountain Division’s WWII activities and a second pair of gloves. A loose roller skate with pretenses of being a sports car was an uncommon sight on any road but in the up-country it would have been cause for open-mouthed gawking. Except up-country folk didn’t do that. They had corners of eyes for such unseemly scrutinizing. I got a lot of eye-corner. But often I was far out of anyone’s ken on forsaken roads bandaged in white and collecting more. 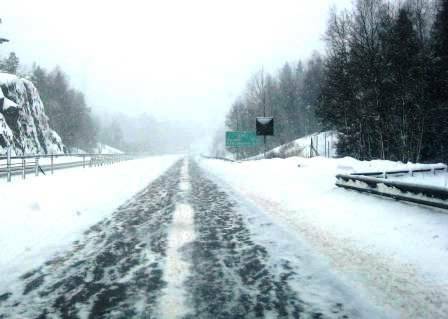 Maybe I passed the occasional orange rectangle of a farm house window spilling in an elongated image on the crusty surface outside, but mostly it was a trackless path just one snow-plow blade wide that I followed through (I hoped) the semi-wilderness of the Adirondacks. All these decades later I can replay on my retinal screen the TC’s headlights, two distinct little beams, probing into the flurries coming straight at me like a swarm of luminous gnats. That’s all there was in the shaken glass ball in which I drove. When I want the calmness of suspended time, and even suspended gravity, I can allow another image to play across my memory. I reach the lakeside cabin in which I was to stay, the lake recognizable in its masquerade as an expanse of a flat field, some cross-country ski tracks still vaguely visible on its surface. The snow was now floating slowly as if in heavy liquid, each flake turning slowly as if to let me see that it was truly different from its neighbor. Count the sides. See? Six. As I unfolded out of the TC a haloed light glowed a welcome by the cabin door. Then the snow, almost furry in its fatness, suddenly became motionless and the TC and I, and the lighted cabin door, began moving upward through this mime of a snow flurry. As I rose I collected snow on my shoulders. It melted into tears on my cheeks. I was mesmerized by this magically inverted world for I don’t know how long because I think clocks were winding a different way, too. Then the snow simply stopped. I wrestled my bag out of the car, clicked the TC into ticking darkness and went in to bed. Dreams, on nights like this, swirled with snowy roads as well. My rally days were in the next decade, the ‘60s. The Monte Carlo class victory came in 1964 in a Ford Falcon. Yes, Falcon. With a fiberglass body and a Holman and Moody prepared engine and Anne Hall, a.k.a. the Flying Yorkshirewoman, sharing the driving duties with me. But let’s get to Now and some thoughts on what I see slip, slip sliding by the TV cameras. These drivers, and maybe you, are laboring under two critical misapprehensions. One, they think the steering wheel steers a car. And two, they think that the brakes stop a car. Just watch evidence to the contrary slide by you on the screen. The drivers are whipping the wheel one way then back the other and their vehicles are doing something quite unrelated. Their brake lights are glowing red and the cars are paying no attention. Here are some facts to keep in mind that might help you weather the weather. The steering wheel does not steer your car, it merely aims the front wheels. Why a car turns in the desired direction is that the tires take little bites of the road’s surface one after the other. It can do that because there is friction between the rubber and the road. The tires get a grip on the road. They have traction. And that’s what actually turns the car, not the steering wheel. When friction is minimized by ice — or wet leaves in the fall, or gravel in the summer, or a worn tire – or anything that compromises the ability of a tire to grip the road’s surface you cannot control with the steering wheel the direction your car is going to go. As for braking, that takes friction, too. Boy, does that take friction. Ordinary brakes are your worst enemy when friction is fugitive. Drill this into your head until it is part of your being: All that brakes are designed to do and all they can in practice do is stop the rolling motion of your tires. Tires can skid in an assortment of directions while sitting as motionless as a deli donut on a silent wheel. Repeat after me: the wheels must be rolling so the tires can take those little bites of the road that creates a turn. You request the direction by turning the steering wheel but the rolling tire makes the turn. Fortunately, many cars are now equipped with anti-lock brakes (ABS) which allow the wheels to roll-lock-roll-lock in a really rapid pulsing while a foot is pushed hard on the brake pedal. (And do push ABS brakes really really hard). Turn the steering wheel in small, small increments. You are merely aiming the wheels and they must be able to roll when so they get a bite. Wheels tuned too severely will skid rather than roll. Aim for areas where traction may be better, like the rough edges of roads, bare spots, cut-up snow rather than the packed stuff or shining ice. If your car has ABS stay firmly on the brakes. If you don’t have ABS stay totally off them. Or stroke your brakes lightly just short of locking up the wheels. If you cannot feel that point, elect to stay off them. If you have a clutch, push it down. Steer, lightly, to keep the front end in front of the back end. Hooking your eyes on a place you want to go and breathing your way there will help. Honest. If there really is no place to go aim off the road picking what looks softest and farthest out of the way. Make a judgment call: If cars are piling up at dangerous speeds decide whether it’s better to remove yourself from the scene or trust the protection of your car. Remember, semis have a lot of mass. Practice small steering, proper braking and purposeful looking in a wide empty parking lot. You have very little control in a car loose on ice but more than you might think – take what you’re offered and expand it with care and intelligence. And don’t forget Steamboat Springs. This entry was posted on Monday, December 30th, 2013 at and is filed under Automobiles. You can follow any responses to this entry through the RSS 2.0 feed. Both comments and pings are currently closed. If people in the U.S. were actually required to have the most basic driving skills the number or accidents and fatalities would drop significantly. A day of professional snow driving instruction could help 99% of drivers in the U.S. IMO.